This is the first time I’ve bought Mixels, and I have to say, I quite like them! They’re great for parts and colours, and they look fun to build. Mixels eyes are used in many MOCs (My Own Creations), and they are very re-useable. All of the Mixels sets have a back story, but I’m not going to get into that. 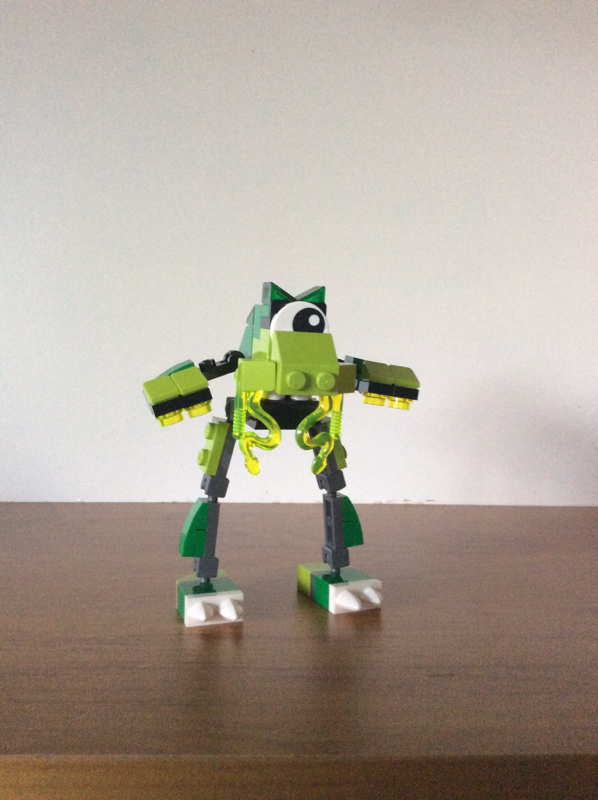 You can check it out on the LEGO Mixels website. 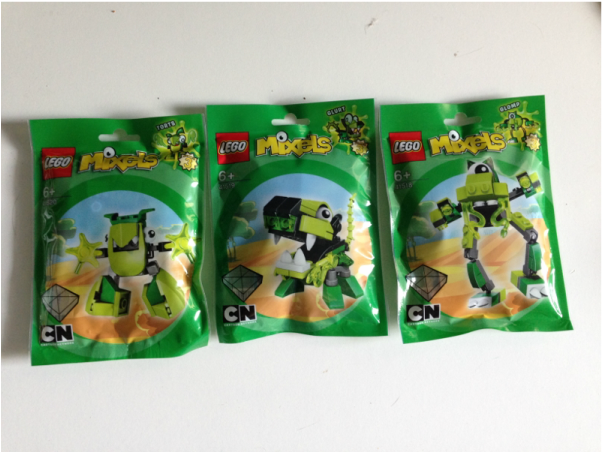 Every Mixel comes in it’s own individual polybag, with the colours of the bags matching the group. The top right corner also has an animated version of the character, and the bottom left has a clear window so you can see a couple of blocks without opening it. It’s kind of pointless, however, as you don’t end up seeing much. 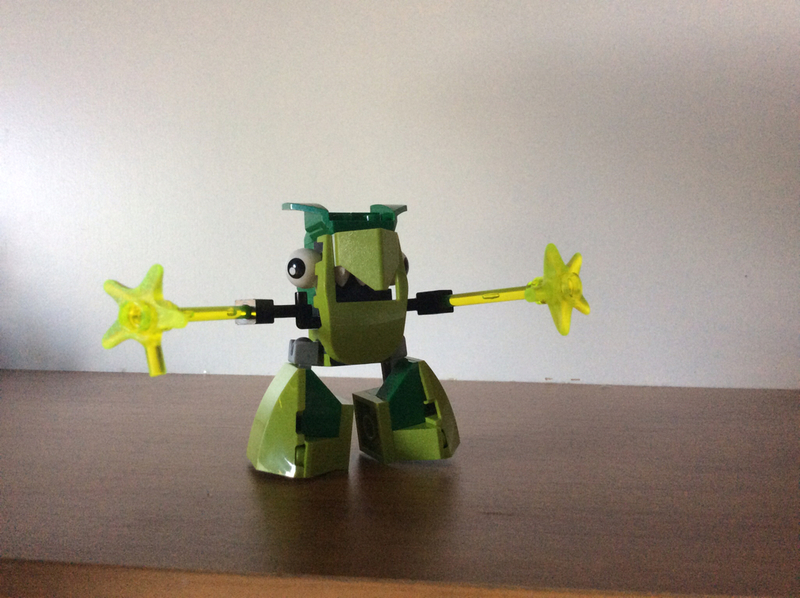 If you happen to get all three Mixels from a set, they get combined into the Max version, in this case, the Glorp Corp Max. The instructions for the Max are available on the website. Every bag has the parts, as well as a little instruction manual folded in half. You’ll also occasionally get a Nixel, the sworn enemy of all Mixels. He’s not much at all, but there’s a photo further down. These sets are obviously all about green. Lime green, dark green and transparent-neon green are all big factors in these sets, with newly coloured items like Torts’ hands (starfish) appearing in these sets exclusively. There are plenty of other useful bits and pieces like mini-ball joints, eyes and teeth playing a big part. 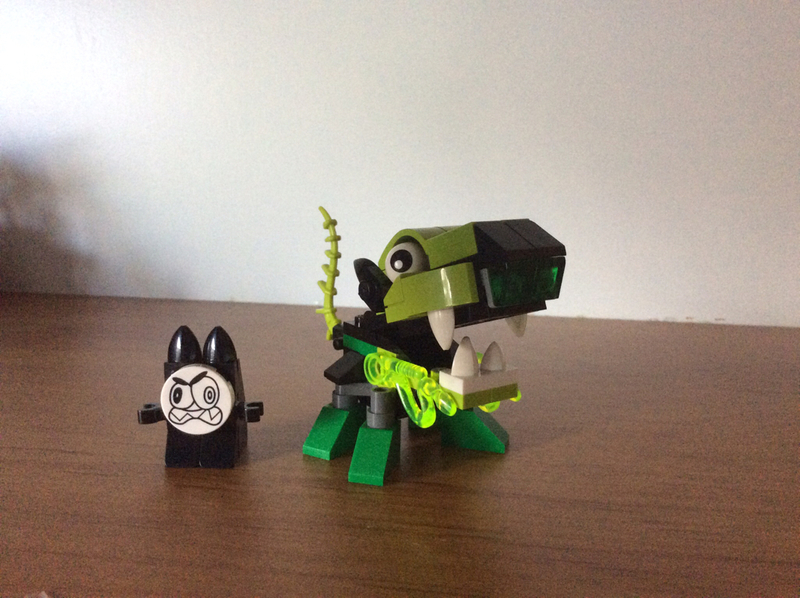 You get 4 snakeblades if you buy Glomp and Glurt, which look kind of like mucus, and Glurt also comes with a nice looking spiky tail that’s seen a bit in Chima, Bionicle and Ninjago sets. These builds come together pretty quickly, as there isn’t much to them. As far as movement goes, Glomp is the best with all joints being poseable. He’s the tallest of the lot, with long, lanky legs and short stubby arms. I’m not too sure about the tiny hands, but I like the face. Glurt is at the other end of the poseability scale, with only the jaw and tail moving. Glurt looks kind of like a dog, with the snakeblades stuck to the side, I’m guessing to be like slobber. The really great part about Glurt is they way the wheel arches have been used as eyelids. It looks great! The Nixel comes with Glurt, and is extremely basic, but does give you black teeth, and a nice printed round face tile. Torts is the funniest looking of the bunch, with a beaky face that makes him look like a very odd owl. The starfish look great as hands, and I really like his stubby little feet. I like the fact that you have to explore the LEGO website to get the instructions for the Max. It makes it a little more exciting for kids. The Max certainly needs to blow his nose, but I’m not really sold on the hands. The good thing is you can make it what you want! 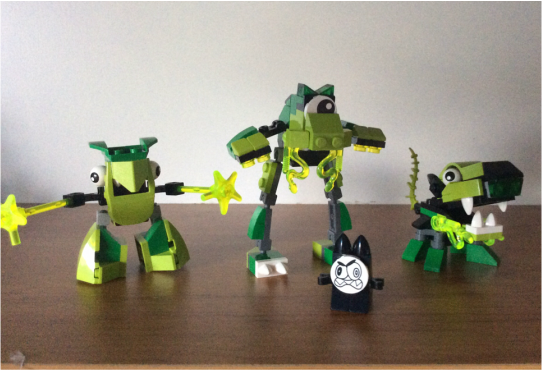 The biggest drawcard for these sets is the re-creation of new Mixels. 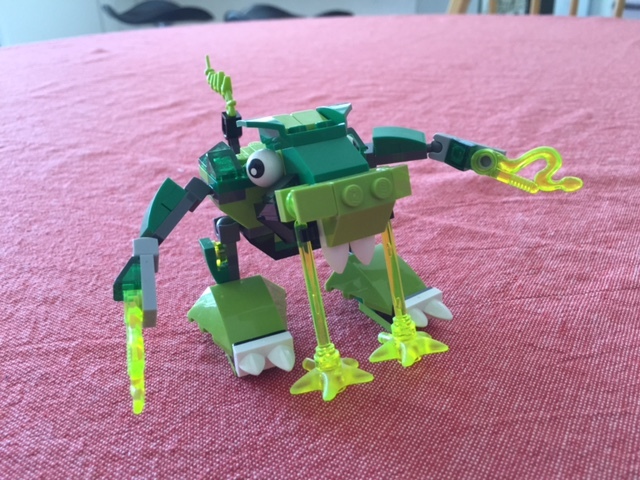 Kids love creating new ones, and that was the biggest hope for LEGO as well. Being able to mix and match and encourage new ideas is what LEGO is all about of course! Being my first Mixels set, I’m impressed with the parts, but they won’t be displayed with my other sets for very long. The Glorp Corp gets 6 out of 10 googly eyes. Next on the review menu will be 60073: Service Truck. Yep, the one with the port-a-loo!